Generation Zero plunks you down in the countryside of Sweden and immediately things are shrouded in mystery. There is very little exposition and it is up to the player to figure out how the world ended up this way. The gameplay is a little different than your typical first-person shooter, balancing quiet exploration with tense skirmishes against feral machines. The game actually plays very similar to a battle royale game like PUBG where there are peaks and valleys of action. The valleys have you looting houses and cars, scavenging for ammunition and items to give you an advantage in combat. These quiet parts of the game build tension as the environmental storytelling paints a clear picture of the destruction that has happened at the hands of the machines. The peaks hit and cash in on that build-up, making firefights both frantic and also a huge release of tension once complete. It really is a rush. Generation Zero plays more like a guerilla tactics game as you really don't want to take things head on, and you have to play dirty to get an advantage over the enemies. The machines you are battling will quickly outrun and outgun you if you're not careful. Stealth is a must. 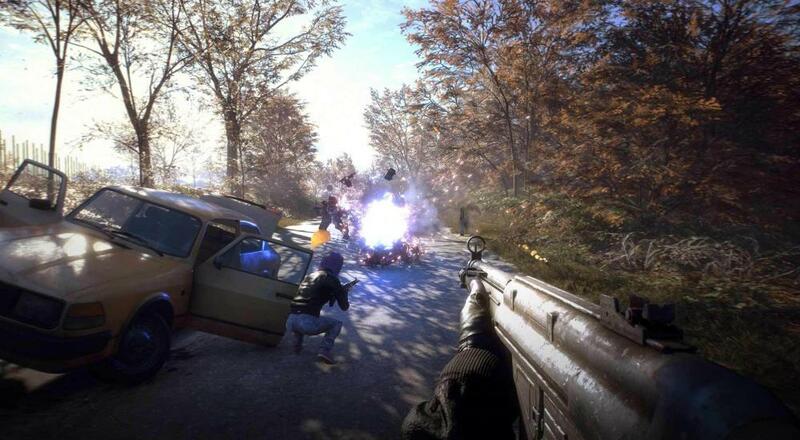 Use of items to distract and gain an advantage over the machines is strongly encouraged, so the looting of radios, flares, and any type of improvised explosive will come in very handy for combat. The robots in Generation Zero aren't state of the art terminator beings, but have been designed by Avalanche to match the 80's aesthetic. They have wires coming out everywhere, and have a grit to them like they were put together in a junkyard. It is all very fascinating and the gameplay is a nice change from an all out shooting gallery. One of the main things you will notice is how pretty the game is, which can be attributed to the previous work Avalance has done with their outdoorsman simulator The Hunter. Using their in-house Apex engine, they have built a big and beautiful world, successfully recreating an accurate throwback to decades past. Wandering across the Swedish countryside with the sun setting looks and feels so good, especially when you roll up into a dilapidated town that is only lit by moonlight. Much of your time is spent wandering around in search of supplies, so it is nice that it feels good to be in this world. One gripe we had was in such a big world, there are many copy and paste buildings which takes you out of the experience a bit when you have searched the same barn half a dozen times in your game session. Generation Zero can be played solo, but it is one of those games which is best served with a group of friends. Wandering through the countryside with a team amplifies those peaks and valleys I spoke of earlier. Choosing a specific set of skills when leveling up allows for people to help their team in different ways. Combat options change as you aren't going to overwhelm the machines with raw power, but there are better strategies with more people. It is one of those games which will lead to emergent storytelling that is difficult to describe in words, but something you have to experience yourself. I really want to dive back into the game, but as of now there are a bunch of bugs that need to be addressed. Mainly, Jason can't run the game because of a CPU draining bug that renders the game unplayable, which will hopefully be fixed in the near future. Much of our discourse throughout the stream VOD centers around the decision not to put the game into Early Access, which is worth listening to IMO. The main through line is that the Early Access path allows a bit more leeway with things like game crashes and bug fixes at release, but also the struggle with being seen in the sea of Early Access releases. Page created in 0.8821 seconds.